Stephanie is a writer based in the Victorian mining town of Leadville, Colorado, where she lives at 10,251 feet with her husband, five chickens, two bantam English game hens and one Cavalier King Charles Spaniel. After a former life in big cities–New York City, Tokyo, Hong Kong, Boston, Mexico City, Atlanta, Los Angeles and Santa Fe–she now enjoys the bustle and birdsong of Leadville, population 2,700 in town and 7,000 in the county, not counting dogs, burros and the occasional bear. She likes her Victorian attire spiced with a little neo-Victorian futurism and the biggest bustle possible. She published her debut novel Toru: Wayfarer Returns, the first installment in her Sakura Steam series, in February 2016 through her own imprint, Palantir Press. She is working on her second novel, a historical novel set in 1520s Mexico. Toru: Wayfarer Returns by Stephanie Sorensen is book one in the Sakura Steam series. Set in the late 1800s, the story follows a young man named Toro, who returns to his homeland of Japan. Toro was shipwrecked and taken to America, and returns to Japan, despite the threat of death from an evil shogun (who doesn't want anyone who has left to come back). Toro must utilize all of his knowledge and skills in order to outsmart and stay ahead of those who wish him and his country harm. The plot and the world of this book form a unique combination of genres. It was so interesting to not only read about shoguns, samurais and ancient Japan, but to also have airships and other steampunk elements. This really elevated the story to a new level. First off, I just want to say that I love the book cover! I think it really embodies the plot of the book (the unique combination of feudalistic Japan and steampunk) and will really catch readers' eyes. I found Toro to be a likable hero; he was stubborn and resilient, but also flawed and uncertain at times; I think this gave him a very realistic appeal. And fans of strong female characters are sure to love Masuyo! She was the perfect companion for Toro and I really enjoyed all of their conversations and interactions. You can tell that Sorensen took great care to research this period in Japanese history. All of the authentic little details and accurate descriptions really lend not only credibility, but also believability to the storyline. Sorensen takes a variety of real historical facts and seamlessly blends them together with exciting steampunk elements, creating one entertaining story! I would recommend Toru: Wayfarer Returns by Stephanie Sorensen to all fans of action, adventure, historical and steampunk genres. Whoa! That's exactly what I thought to myself when I finished reading Toru: Wayfarer Returns, the first book in the Sakura Steam Series by author Stephanie R. Sorenson. This book was an absolutely fantastic read of steampunk alternative historical fiction, and a story that will keep readers obsessively turning the pages from the start through the finish! Follow the story of Toru, a shipwrecked fisherman, who has returned to Japan after a stint in America. 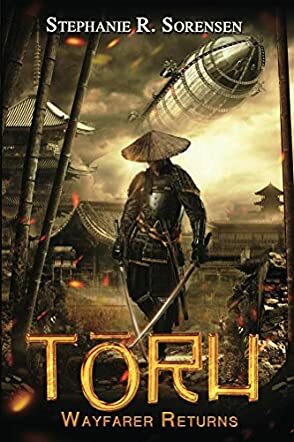 The shogun had forbidden his return, but Toru is committed to saving his homeland from invasion, and is willing to do just about anything to make that happen. Will Toru be able to convince others to help him meet his aim? You'll have to read the book to find out! I very much enjoyed Toru: Wayfarer Returns. This book kept me on the edge of my seat from the very first pages, and I completely enjoyed author Stephanie R. Sorenson's creativity and ability to write a unique storyline overlying the actual time period of Japan in 1852. Author Sorenson has done a brilliant job at creating characters that her readers will connect with and care about, certainly no small feat. Any reader who enjoys steampunk, historical fiction, or just a great read in general should absolutely read Toru: Wayfarer Returns. I highly recommend this book, and am very much looking forward to reading the next in the series as soon as it is available. If it's anything like this book, it will absolutely be a worthwhile read! In a completely fantastic work of steampunk alternative historical fiction by author Stephanie R. Sorenson, Toru: Wayfarer Returns (Sakura Steam Series Book 1) is a book that lovers of steampunk fiction simply will not be able to put down! Taking place in Japan in 1852, the story follows a young fisherman, Toru. He was shipwrecked and rescued by Americans. He returns to Japan on a quest to save his country from foreigners, and is ready to do just about anything to achieve it. Utilizing all the creative tricks of the trade found in steampunk fiction, this story is a real roller coaster of an adventure story. Will Toru fulfill his aim or meet his end? Only time will tell! I loved Toru: Wayfarer Returns. Loved. It. How's that for a review? Author Stephanie R. Sorenson is an extremely intriguing new voice in the field of steampunk fiction, and any lover of the genre should run, not walk, to get her book! She is creative and unique, even in a genre known for being creative and unique, and her world creation skills are simply second to none. I thoroughly enjoyed her character development and story building, and love that this is the first book in a planned series. I will certainly be anxiously waiting to read more in the Sakura Steam Series, and hope that Stephanie R. Sorenson is already hard at work on the next installments. I give this book an extremely high recommendation, and encourage anyone who loves steampunk fiction, or just an intriguing new read, to get this book as soon as you possibly can!